Crew Spaceflight Services - today! Space Operations, Inc. (SpaceOps) is a privately-held corporation established to provide reliable and technologically sophisticated spacecraft hardware focused on carrying flight crews and vital cargo into space. The company will develop, operate and maintain reusable spacecraft for use by the U.S. Government, and other organizations or individuals with space flight requirements. Partnering with WestWind Technologies, Advanced Solutions Inc, BSRD LLC, and the Southern Aerospace Company, SpaceOps is bringing highly motivated aerospace companies together that provide multiple resources to take us back into space using the most advanced techologies available today. Each vehicle will be fully tested and certified for flight safety by the FAA. You can download a pdf of our executive summary or our NASA proposal. Detailed business and technical plans as well as briefings are available. Contact us at 256-774-3096 or email us. 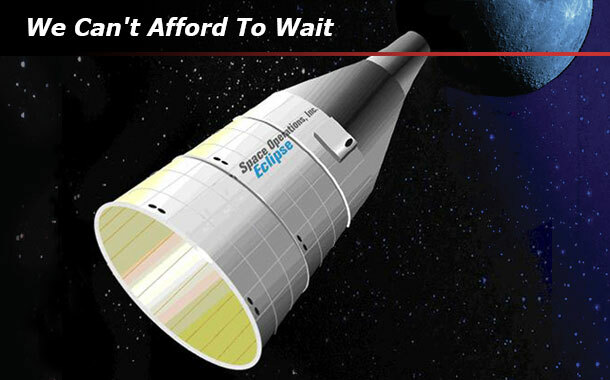 Launch people into orbit from the U.S. NOW with the ECLIPSE 2-seat orbital spacecraft! The first step: simulator. Click here for the Kickstarter link to the project. BSRD - Supporting clients in the development of unique space propulsion systems. Boeing, SpaceX Win $900 Million in Awards for Spacecraft “We’re in this kind of embarrassing situation of depending on Russia for crew transportation,” Logsdon said. U.S. COMPANY RESPONDS TO CHINESE "ORBITAL MILITARY OUTPOST"
...needs to have "a U.S.-based, commercial crew launch capability at the earliest possible time." WATCH OUR VIDEO ON YouTube! NEWS31 CLIPS The Future Today! Copyright 2012 Space Operations Inc. All rights reserved.